The Red Sox clinched a World Series title in Fenway Park for the first time since 1918. In the year 2101, after Ted Williams has been awakened from his cryogenic slumber, New Englanders reflecting on the 200th birthday of Red Sox baseball will find a special place in their hearts for the Improbable Dream team of 2013. Over drinks at Mixology on Papi Way, formerly Brookline Avenue, fans will debate whether David Ortiz was a greater clutch hitter than his son, D’Angelo “Little Papi” Ortiz, was in the 2020s or his grandson, Dustin “Baby Papi” Ortiz, was in the 2050s. Baseball historians will marvel at a guy on a work visa named Koji Uehara, who traveled more than 14 hours by air from Tokyo to Boston — a four-hour hop in 2101 — and rescued a bullpen in crisis by submitting one of the most spectacular runs in the annals of major league closers. 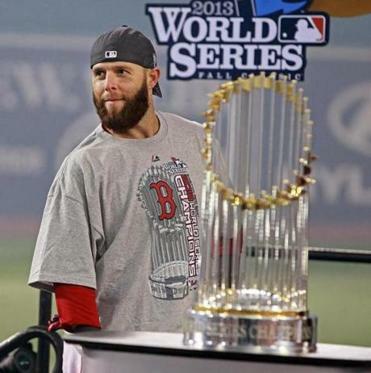 Sox diehards will celebrate the Whiskered Wonders of ’13: Pedey, Salty, Napster, and the gang. They will not have forgotten a rookie called “X,” who was too young to sprout a beard but old enough to help his Sox brethren light up the city during Mayor Thomas M. Menino’s last hurrah. 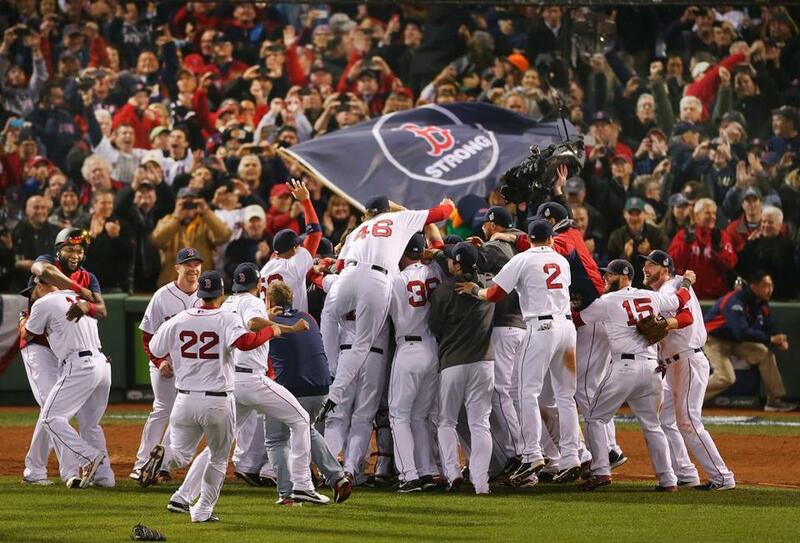 History will show that the 2013 Sons of John Farrell did what no other Sox team had done. In a year of tumult and sorrow — terrorist bombings at the Boston Marathon, a federal government shutdown, murder charges against a New England Patriots star and the son of a beloved Boston baseball broadcaster — the 2013 Sox rose from the cryogenic tank (a last-place divisional finish in 2012) to become champions of the universe. Look back on the images that highlight the Red Sox’ playoff run to become World Series champions. By outlasting the St. Louis Cardinals in a series for the century, the 2013 Sox did a little something to help heal a wounded city. And in the days before levees were raised against the rising sea, hundreds of thousands of New Englanders hailed the team as it paraded through Boston’s byways and waterways in things called duck boats. Only seven months after Bostonians took shelter amid a manhunt and police firefight with alleged terrorists, citizens young and old danced in the streets to an old-time anthem, “Dirty Water,’’ their fake beards bobbing in time. It all felt very different from the championship celebrations of 2004 and 2007. In ’04, the city had convulsed in cathartic bliss after the Sox ended an 86-year championship famine. That triumph had liberated generations of New Englanders from the psychic damage they had suffered over decades of baseball heartache. The ’07 title had been frosting on the cake, a Riverdance with a team of veteran stars (Ortiz, Manny Ramirez, Curt Schilling, Josh Beckett) and young guns (Dustin Pedroia, Jonathan Papelbon, Jacoby Ellsbury) that had been expected to compete for a championship. The Amazin’s of ’13 were one of a kind. They were formed in the rubble of the Great Demolition of 2012, when the Sox brass responded to a chicken-and-beer abomination in September 2011 and the Valentine Massacre of 2012 by dispatching their overpaid malcontents (Beckett, Carl Crawford, and Adrian Gonzalez) to the cash-happy Dodgers. In the hot stove season that followed — yes, there were still a few hot stoves in ’13 — Sox owners repudiated their practice of awarding long, lucrative, self-sabotaging contracts to the likes of Crawford and Gonzalez. The reboot fell to Ben Cherington, the second-year general manager. In the depths of winter, Cherington’s moves stoked little excitement among fans who were still holding their noses from the stench of 2012, the franchise’s worst season since 1965. The angriest fans called him stupid. But Cherington had the last word when his winter acquisitions — Uehara, Shane Victorino, Mike Napoli, Jonny Gomes, Stephen Drew, Ryan Dempster, David Ross, and Mike Carp — proved lighthearted and likable, their personalities and performances helping to turn a baseball disaster into a delight. Along with the returning core players and holdovers, the new crew brought good times back to the Sox clubhouse. The ’04 team had Pedro Martinez’s miniature human mascot, Nelson de la Rosa. The ’13 team had Jake Peavy’s cigar store Indian. The ’07 team had Manny Being Manny and a kilt-clad Papelbon. The ’13 team had a collection of tattooed and bearded dirt dogs who feared nothing, it seemed, but closing time at the saloon. “What’s broken can be fixed,’’ the Sox brass promised in a preseason mea culpa campaign, and the team set about proving it. The 2013 Sox began their baseball resurrection the day after Easter, surging to an 18-7 start. They slumped a bit in May (15-15), and while the Bruins were commanding much of the city’s attention with their drive to the Stanley Cup Finals in June, the Sox were forging their legacy of resilience and churning toward a league-best 97 wins. No, Joe Castiglione, even you couldn’t believe it. No one saw it coming, not even the team’s owners. The Sox had entered the season as 25-1 long shots. Well, maybe one guy sensed something brewing. Four days before the season opened, Boston’s redoubtable All-Star, Pedroia, buzzed fans via the twitterverse. Was it ever. The Sox scored more runs than any other team in baseball. They wore out opposing pitching staffs by seeing more pitches (25,639) than any other team in the majors. They never lost more than three straight games, and they spent 158 days atop the standings, after holding first place for only a single day in 2012. To skeptics who thumbed their noses at the notion of team chemistry contributing to success, the 2013 Sox ate together, drank together, tossed away their razors together, laughed together, and won together. They also embraced the city in its darkest hour. Their contributions went far beyond Ortiz flexing his rhetorical muscle in the team’s first home game after the bombings. The Sox made private visits to hospitals and rehab centers. They saluted first responders, and the organization paid attention day and night to those who forever would be affected by one of the most frightening and disturbing weeks in Boston history. Then they made October magic. “I think this might be the most special out of all the World Series I have been a part of, to be honest with you,’’ said Ortiz, the first player in 95 years to win three World Series rings with the Sox. In St. Louis, it seemed fitting that Ortiz and Xander Bogaerts — the team’s oldest (37) and youngest (21) position players — lockered next to each other. They represented the past, present, and future. Bogaerts was the youngest Sox player to start in the postseason since Babe Ruth in 1916. Ruth will be remembered in 2101 as baseball’s first great slugger. He remained an exalted figure even when his legendary feats were overshadowed in the late 20th century by players who corrupted their bodies and the sport with primitive chemical enhancers. Ortiz purportedly failed a test for banned substances in 2003. There was no evidence that he violated any prohibition on performance enhancers after that. And in the six-game World Series of 2013, he put up numbers — a .688 batting average and .760 on-base percentage, with two home runs, six RBIs, and seven runs — that rivaled Ruth’s production at his World Series best. Shortly after 11:20 p.m. at Fenway Park on Wednesday, Oct. 30, 2013, Uehara fanned Cardinals second baseman Matt Carpenter for the final out of a series-deciding 6-1 victory. It marked the first time in 95 years that the Sox had clinched a World Series on John W. Henry Way, then known as Yawkey Way. For Sox fans, there were sights and sounds to remember. St. Louis had the Arch, while Boston had a spectacular rainbow rising over the Fens on the eve of the Fall Classic. The Cardinals had Rascal Flatts. The Sox had the Dropkicks. The Cardinals had the “obstruction [bleepin’] rule’’ in Game 3. The Sox had Koji’s climactic pickoff in Game 4. The Red Sox will be remembered for facing some of the best pitchers on the planet in postseason showdowns against the Rays, Tigers, and Cardinals. The Sox managed to bat .286 in punching out the Rays in the Division Series, but they hit only .207 the rest of the way. They prevailed because their posse of game-changers, led by Papi, Victorino, Napoli, Gomes, Pedroia, and Bogaerts, made an art of clutch hitting in October. The Sox also had their own stable of elite pitchers, led by the “L’’ brothers, Jon Lester and John Lackey. In 2011, the “L’’ stood for “losers’’ after their contributions to the team’s historic September collapse. But after their excellence in 2013, the “L’’ stood for “lucky,’’ as in Boston was very lucky to have them. The Sox were fortunate, too, to have Dempster, Felix Doubront, Clay Buchholz, and, after the trading deadline, Peavy. And the starters had the luxury of handing off to one of the league’s stingiest bullpens, anchored by the sensational Uehara and the set-up tandem of Junichi Tazawa and Craig Breslow. In many ways, Gomes wound up epitomizing the 2013 Sox and maybe the city itself. A journeyman playing for his fifth team in six years, Gomes had survived a heart attack and a car wreck that had killed a friend. He had grown up at times on the edge of homelessness, and he had never been considered a sure thing in the upper echelons of baseball. But Gomes exuded the will to persevere, to overcome. For all the bad things that had happened to him, the Sox, and the city, Gomes saw only glints of good things ahead. The 2013 Sox got some breaks and made some breaks on their way to making history. In the year 2101, New Englanders will salute the Sox-backed Jimmy Fund for helping to eradicate nearly every form of cancer in the 21st century. And memories of the 2013 Sox will still bring a twinkle to their eyes. Bob Hohler can be reached at hohler@globe.com.